Former Secretary of State Hillary Clinton and President Bill Clinton laugh during a speech by U.S. Sen. Tom Harkin (D-Iowa) at the 37th Harkin Steak Fry Sept. 14, 2014, in Indianola, Iowa. Hillary Clinton has some political observers in a frenzy of excitement about her appearance on Sunday at a Democratic fundraising event in Iowa. It was an annual shindig organized by the state's Democratic party, but folks are speculating that the former secretary of state is laying the groundwork for a 2016 presidential run, especially since Iowa's Democrats will be the first voters in that cycle's primaries. 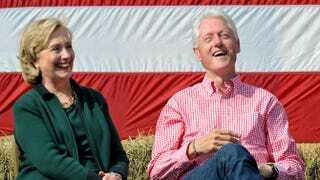 According to this report from CBS News, she received a less-than-effusive reception: "Both Clinton and her husband, former President Bill Clinton, spoke at the Steak Fry. She was warmly received, but the enthusiasm was not over the top: No chants of 'Run, Hillary, run,' were heard, perhaps reflecting an understanding from her supporters that Clinton may lack the spark to inspire voters the way Obama did in 2008, even if she now is the party's best hope at winning the White House." The Hawkeye State has been the place to be for former and present-day politicians who are vying for a coveted slot on the 2016 Democratic presidential ticket. One woman who attended the steak-fry fundraiser on Sunday expressed support for another female politician whose name has been widely circulated as a viable alternative to Clinton: Massachusetts Sen. Elizabeth Warren. "I want to see what others do, like Elizabeth Warren," Nancy Bobo, one of the event's attendees and an early President Obama supporter, told CBS News. As Bobo noted, while Clinton is certainly the most popular candidate being discussed for the 2016 cycle, that doesn't mean others don't have a chance. "No one thought there was any room for anyone else in 2008," Bobo said, referring to Obama's decision to run against Hillary in 2008, "and there was." According to the CBS report, other Democratic politicians who have attended major events in Iowa in the past several months include Maryland Gov. Martin O'Malley, former Montana Gov. Brian Schweitzer, former Sen. Jim Webb of Virginia and Minnesota Sen. Amy Klobuchar.